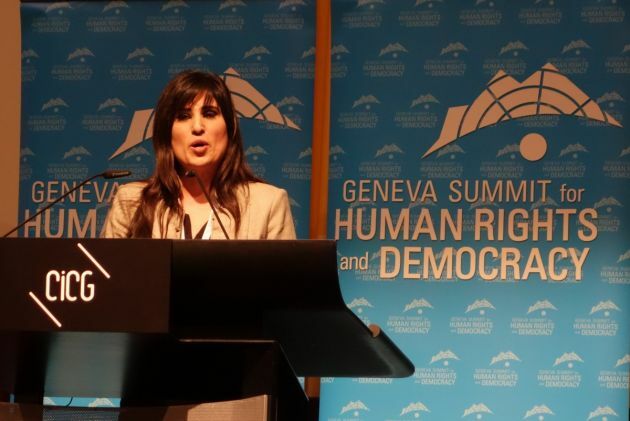 (Photo: Ecumenical News / Peter Kenny)Naghmeh Abedini, the wife of jailed Iranian-American Pastor Saeed Abedini speaking at a human rights conference in Geneva, Switzerland on February 25, 2014. The American Center for Law and Justice says its team at the United Nations in Geneva has presented an oral intervention before the Human Rights Council on behalf of imprisoned Pastor Saeed Abedini. "Our international affiliate, the European Centre for Law and Justice (ECLJ), made the presentation on behalf of Pator Saeed - a U.S. citizen imprisoned and tormented in Iran because of his Christian faith," in Geneva on March 13 said the ACLJ. The ALCJ team directly raised the plight Pastor Saeed endures. It said that by trying and imprisoning Abedini because of his religious expression, peaceful association, and assembly of religious believers, Iran is violating its obligations under the UN Charter. It is also disregarding Abedini's fundamental rights. The team said that over the last two years, Abedini was: arrested and imprisoned by the Iranian Revolutionary Guard. The ECLJ said he was repeatedly beaten in prison and denied access to medical care made necessary by this abuse. He has also been denied access to his attorney until a few hours before his trial which was a sham before a judge "so notoriously biased and corrupt" that he was condemned by the European Union for issuing egregious verdicts said the ECLJ. He was disallowed, along with his counsel, from attending the second day of his trial and sentenced to eight years in prison for exercising his Christian faith. "Importantly, our team also directly highlighted the U.N.'s own findings that Pastor Saeed's detention is 'arbitrary.'" Despite recommendations from the UNHRC Working Group on Arbitrary Dentition issued on 26 August 2013, which found his detention in violation with international covenants and urged his immediate release, Iran has continued to detain Abedini while denying him access to necessary medical care. "Therefore, the Islamic Republic of Iran fails to uphold its international obligations as well as basic principles of human dignity. "Critically, we concluded by urging the U.N. Human Rights Council to demand Iran immediately release Pastor Saeed," said the ECLJ.